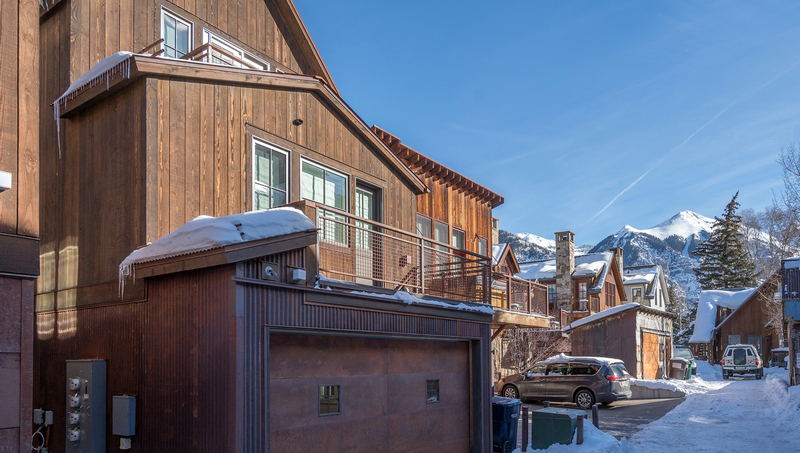 The Gondola Townhomes are a group of six modern townhomes constructed in December 2016. 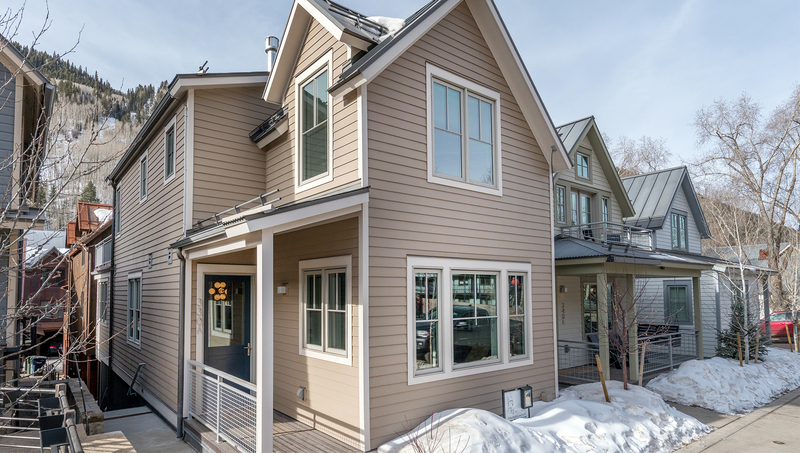 They are centrally located at the corner of S Aspen and W Pacific Street, only one block to the free gondola as well as restaurants and shops along main street. Bedding: King bed, split king bed, queen bed. Walk into this home from the alley sidewalk and enter the mudroom with a stackable washer and dryer. On this level is also the garage and a bedroom with a queen bed. The bedroom has access to an en-suite bath with shower. 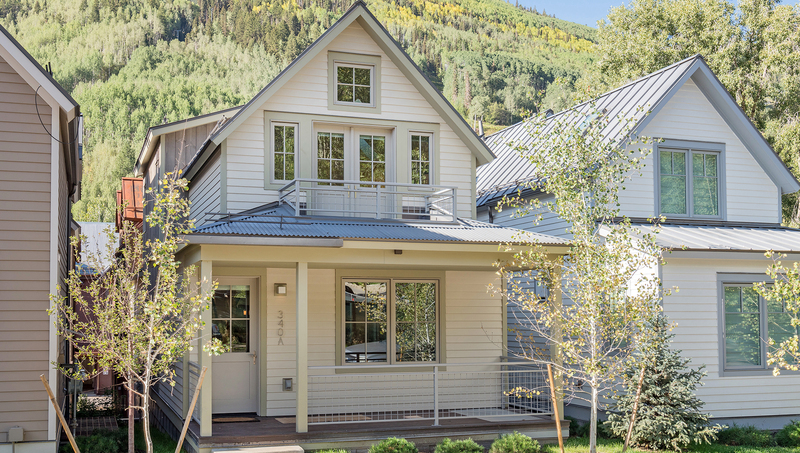 With an unyielding attention to detail in an unbeatable location, intrepid travelers will appreciate everything that this recently completed residence in the Heart of Historic Telluride has to offer. 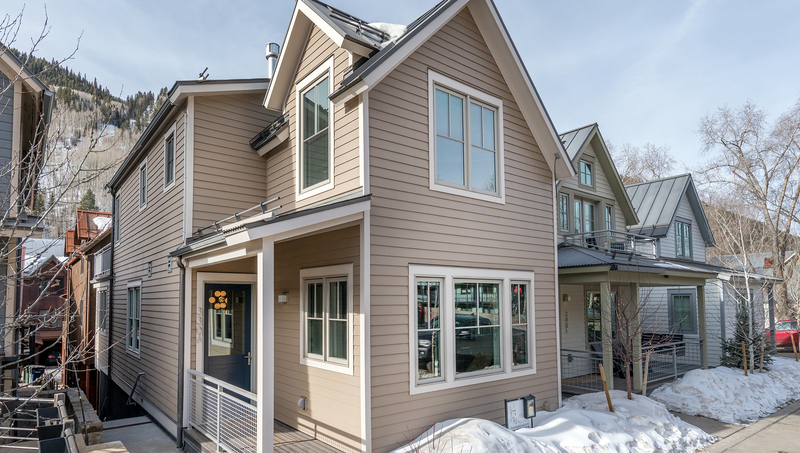 Located in the Gondola district one short block from the center of town on West Pacific Avenue. 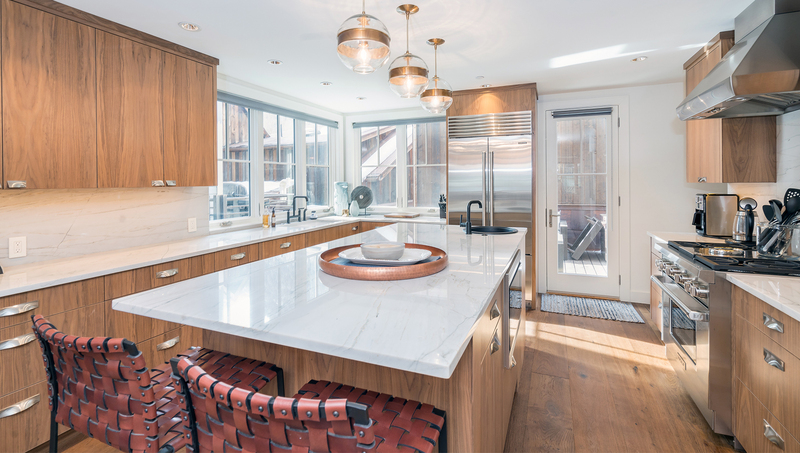 Enter the front door and step into a charming space where the high level of finish and the long view lines make it the natural spot for your group to gather. The kitchen was designed with both a family and a discerning chef in mind, providing ample space to gather and all of the tools needed to create your own delectable dinners at home. 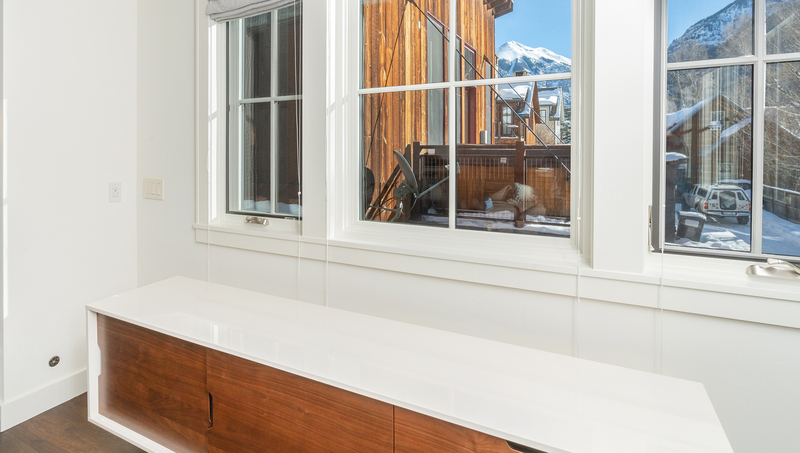 The dining room provides seating for six and the living room has a gas fireplace enhancing the ever-present mountain ambiance. The flat screen on the wall will ensure you catch your team's game or provides music to match the scene. A half-bath and plenty of closet space complete this main floor. 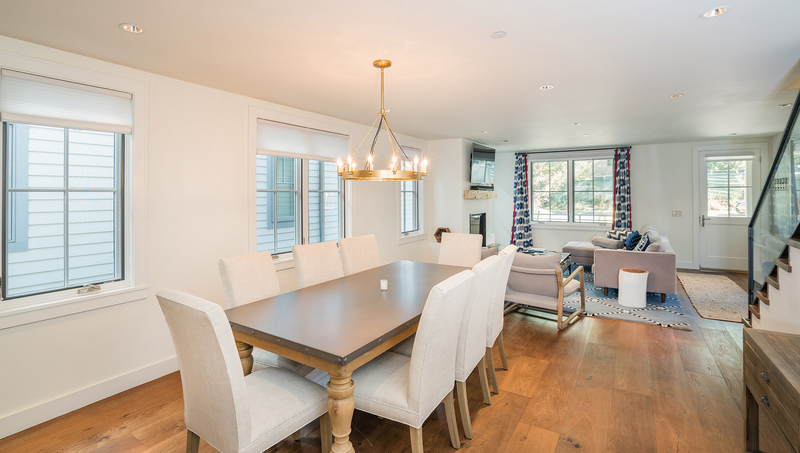 The lower level of the home features three bedrooms. The first bedroom at the bottom of the stairs has a queen bed, flat screen on wall and use of the hall bath that has a shower/tub combo. The second bedroom on the right also shares this hall bath and is also furnished with a queen bed and a flat screen TV. The third bedroom features a king bed, large closet, TV and en suite with a stand-up shower. The private laundry is on this level as is the door to the garage, leading to the alley and the one-block walk to the Gondola. 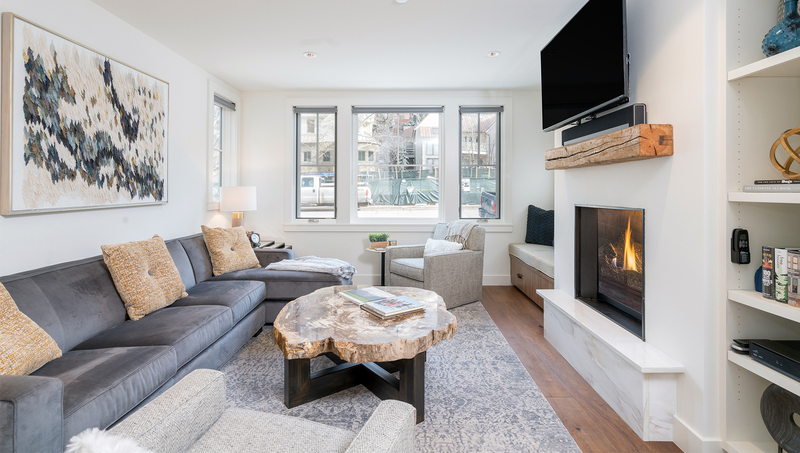 The top level of the home is where the master suite is located, featuring a king bed, TV and den, a private balcony with a hot tub boasting "the best view" in town, vaulted ceilings and up close views of rugged Ballard Peak. There is a walk-in closet and the master bath is finished with a large soaking tub, a rejuvenating steam shower and double vanity sinks. 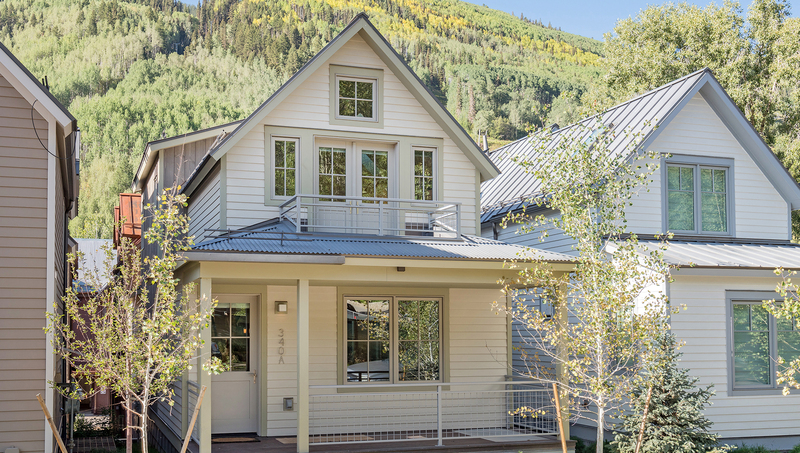 Guests of this newest addition to Telluride's list of compelling homes can take advantage of free concierge services from the friendly, local staff of Sea to Ski. 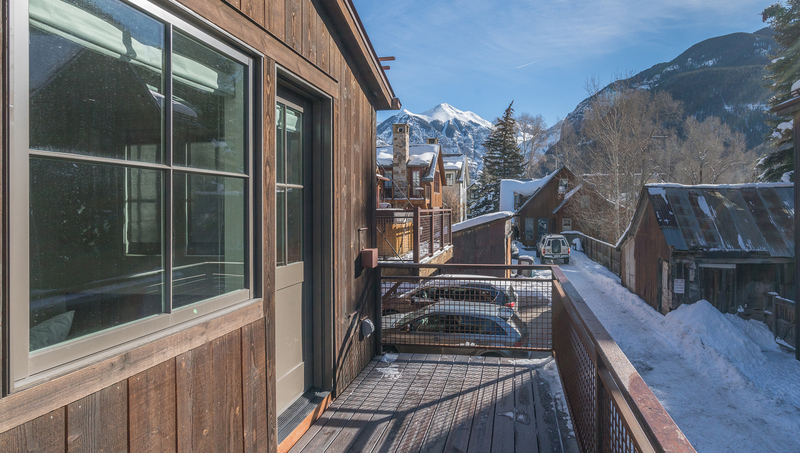 Whether tackling Telluride's legendary slopes, or taking in one of its world-renowned festivals, the central location and quality spaces this property boasts will help ensure that your holiday is as ideal as possible. 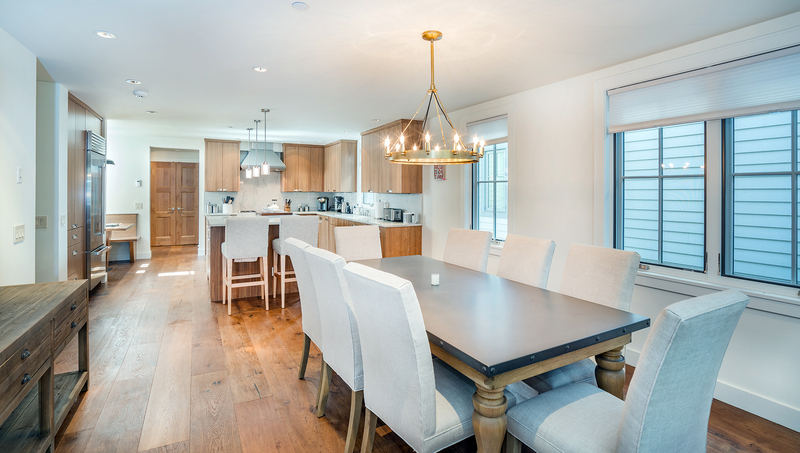 This home is 2,898 square feet. Bedding: King, King, Queen bunk bed, Twin bed. 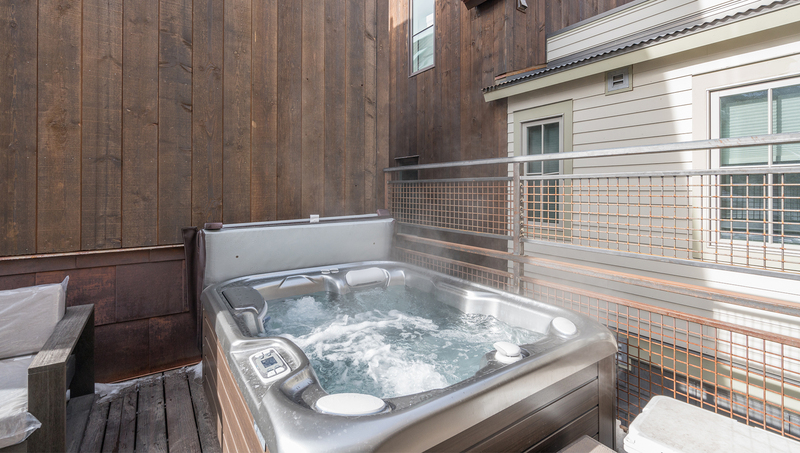 There is a small deck with mountain views off the kitchen with a private outdoor hot tub. 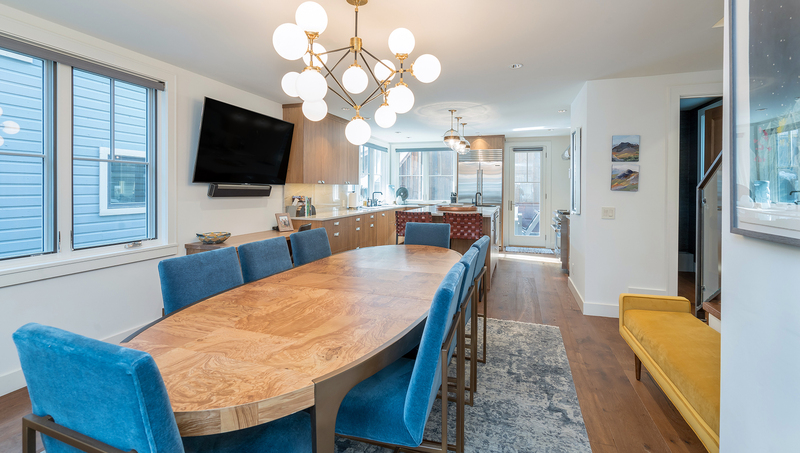 The dining room provides seating for eight and the living room has a gas fireplace and comfortable seating enhancing the ever-present mountain ambiance. 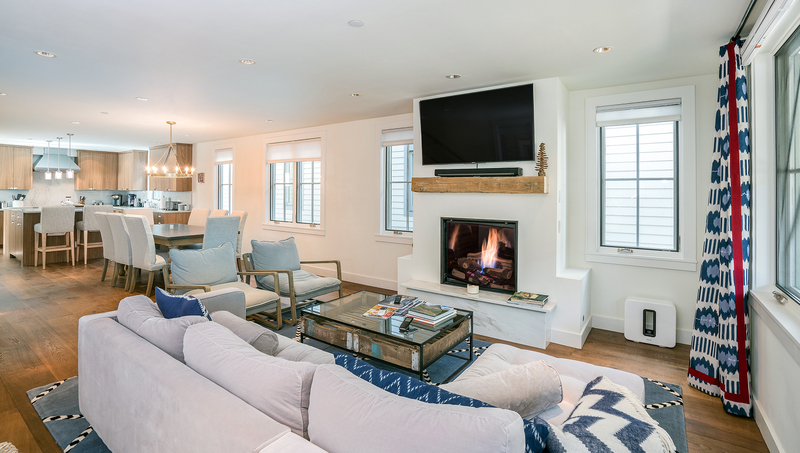 The flat screen on the wall will ensure you catch your team's game or provides music to match the scene. A half-bath and plenty of closet space complete this main floor. 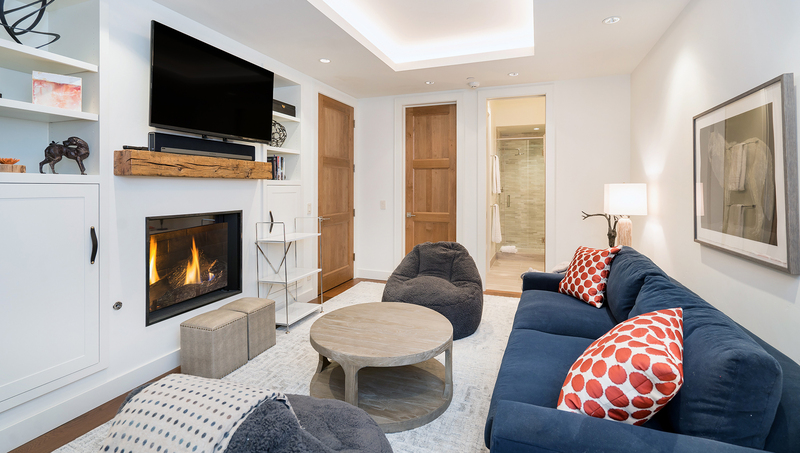 The lower level of the home features a family room with flat screen and the third bedroom. 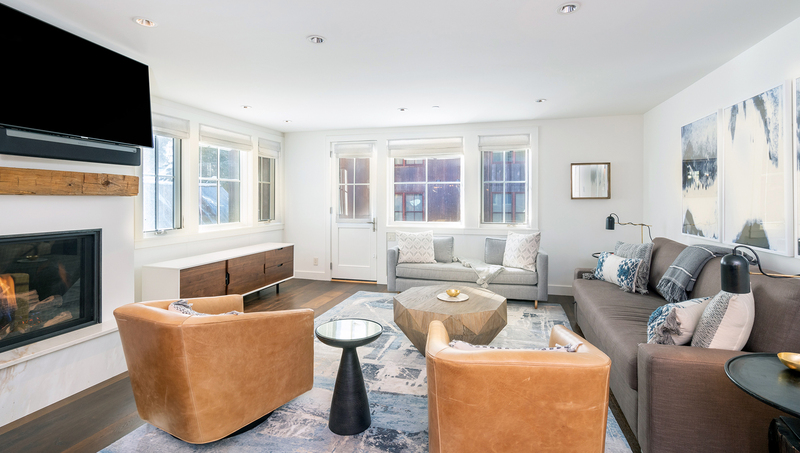 The sofa in the family room can be folded out and used as a sleeper sofa. This bedroom features a queen/queen bunk bed as well as a twin bed (with a trundle bed) and the en suite bath has a stand-up shower. The private laundry is on this level as is the door to the garage on the alley and the walk to the Gondola is only one block. 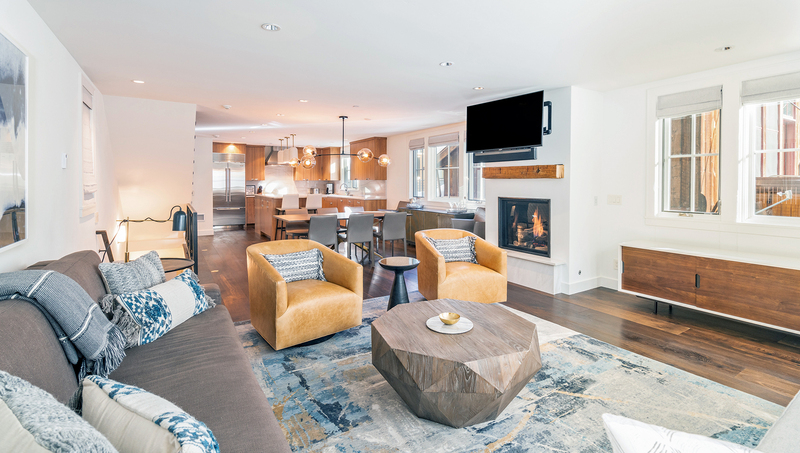 The top level of the home is where the master suite is located, featuring a king bed, a private balcony, vaulted ceilings and up close views of rugged Ballard Peak. 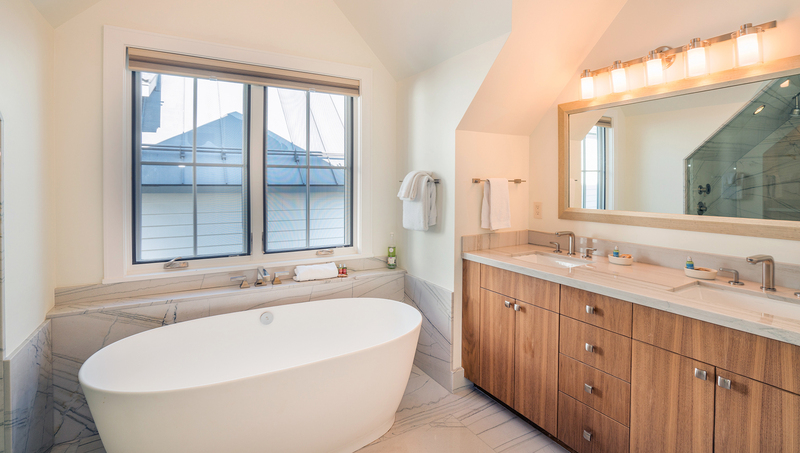 There is a walk-in closet and the master bath is finished with a large soaking tub, a rejuvenating steam shower and double vanity sinks. 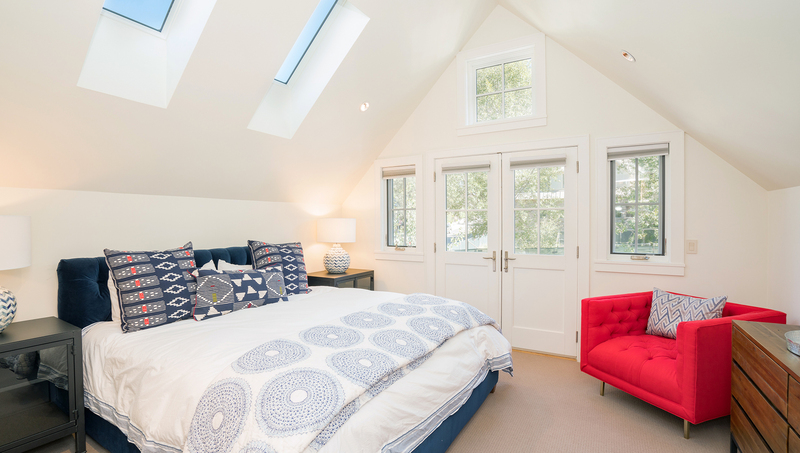 The second bedroom with a king bed and adjoining bath completes the top floor. 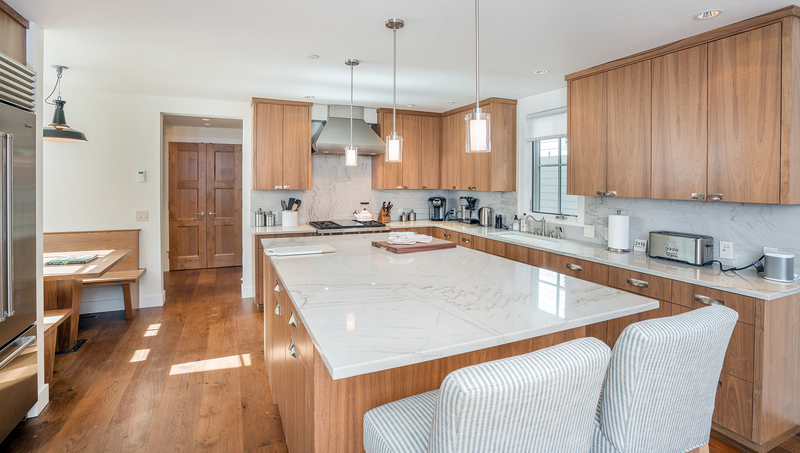 This home is 1,925 square feet.